Even those customers who would never consider crossing the threshold of a Lush store, never mind investing in a bath-bomb or a slice of specialist soap, are charmed and engaged by the customer experience they find. I’ve accompanied many clients and colleagues to stores and what astounds them is the life, energy and enthusiasm of the store teams. From a state of embarrassment, the doubters are soon lost in the depths of the store, listening intently to their guides and trying their hand at skin treatments, immersing themselves up to their elbows in baths of beautifully warm solutions. The question universally asked is “How do Lush as a business achieve this?” The answers are easily available. You just have to ask. Any sales assistant will happily tell you of their own individual experiences of the business. In many ways this is the key. Complete openness and transparency with everyone. 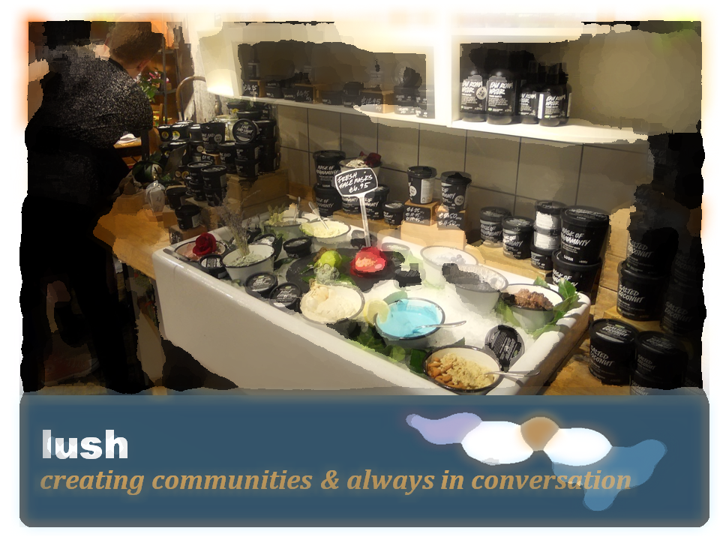 Lush values every one of its staff & customers. Easier said than done. Clearly the business values its people. And clearly the business values every one of its people. There is a subtle but decisive difference. Stores are run for the benefit of the individual staff mix and their personal situations. Of course, there is a framework of operations, however within that the store management have the freedom to manage their staff in a way that fits their personalities, interests and their commitments outside their time in the Lush store. Importantly all personnel are constantly encouraged to self-learn. The starting point is the deliciously names “Lushopedia” full of facts and background of the brands products, philosophies and activities. And maybe above all the selection of the staff is the key to the success of Lush. Although “selection” would not be accurate because the workforce is more “drawn” to the brand because they associate with its values and initiatives. Top to bottom everyone believes in the brand values and shares a passion for them. The concept behind the product, the ingredients sourcing and production are paramount. The communication of various charity initiatives such as Charity Pot and the Slush Fund are highly visible. However, it’s the subtlety of the emotional and physical involvement in the values that drives the loyalty and engagement. Many staff “walk the talk,” are involved in local charities, and even travel overseas to participate in initiatives funded by the brand. The brand involvement is best illustrated by the fact that staff are allowed and encouraged to talk about ethics, the environment and the world with the customer. As much as about the product. And one last thing. You can believe everything you’re told in a Lush store. Because being honest with the customer is a fundamental mantra. One would imagine that same ethic runs through every conversation in the company, from the board room to the stockroom. Or is that all those the amazing fragrances just going to my head? Do you give your customers something to believe in? Do you tell your staff “what to say” or simply “how to speak!”?